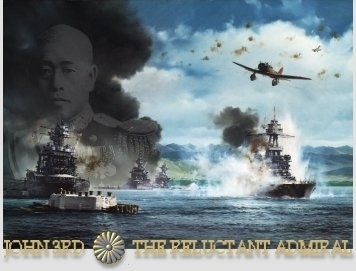 The Reluctant Admiral is a Japanese 'what if' scenario based upon a greater contribution by Adm. Yamamoto Isoroku to the development of the Kaigun in 1936-1941. The premise of the Mod is that Yamamoto exerted a much greater influence first on the Japan Naval Aircraft Industry, then as Deputy Navy Minister, and finally as Navy Minister itself. Yamamoto chooses, at great risk to his life, to forego command of the Combined Fleet and dedicate himself to preparing Japan for a war he didn't want. He adds two new slipways for Fleet construction to facilitate a different, final pre-war expansion of the Kaigun. New and expanded Naval Yards, Heavy Industry, and Armaments are added at tremendous cost for the Japanese economy as the Admiral attempts to prepare Japan for a possibly long war. In so choosing to do this Yamamoto then changes the 4th Circle Building Plan replacing the 3rd and 4th Yamato-Class Battleships with improved Shokaku-Class CVs and a pair of Kawachi-Class fast Battlecruisers, two Tone-Class CAs, an accelerated Light Cruiser deployment, and additional destroyers. Quick, reasonably cheap carrier conversions are moved forward seeing all of the pre-war CVs/CVLs deploy by December 7th or at slightly earlier dates in 1942. Though only a few of these new ships are ready on December 7th, these additions shall make the Kaigun a force to be reckoned with well into 1944. On the ground Yamamoto reorganizes the SNLF units into a Brigade-Sized offensive force and—knowing it will be a war of attrition—converts many Naval Guard into enhanced units with Coastal Defense artillery (using guns taken from refitted warships) for a stronger defensive unit. Additional small units are added to the IJN’s Troops and support units better reflecting Yamamoto's foresight into base building, defense, and expansion needs. While all these units are small and not in great number they promise to help the Japanese war effort. The foresight of the Admiral pays off during late-1942 and 1943 as new ships, aircraft, and ground units enter into the Japanese Order-of-Battle, however, the cost is steep. Though expanded and using modern aircraft many Japanese Naval Air units start with their experience lowered to reflect the dilution of the experienced pilots into new units that start in Japan or arrive during 1942-1943. Supply and fuel reserves start at a much reduced state. The Japanese MUST take the DEI as fast as possible! Once war begins RA postulates Yamamoto’s influence upon the wartime Kaigun. Several more Shokaku CVs are ordered as well as another pair of CAs, and the conversion of several CLs into CVLs. First class destroyers are accelerated and emphasis is shifted to the AA Akizuki-Class at the expense of the more balanced Yugumo’s. Manpower is at a premium within the Fleet so Submarines, Escorts, and ASW forces all see a major retooling reflecting the Japanese quality over quantity belief. Yamamoto chooses the immediately useful projects, large APs converting to CVEs, better 2nd-class destroyers, fast transports and coastal defense fleet. It should be noted that not all the changes are for the Japanese. RA 6.4+ brings major additions and more choice for the Allied Player. The Allies see continued major changes in their starting locations, new air units, the addition of Training Squadrons on mainland USA to allow for an American pilot training program, enhanced aircraft production numbers, additional Allied FP groups, several ground units, a French Squadron at Noumea, the use of CLV Charlotte (a Flightdeck Cruiser), a CLAA conversion for the Omaha-CL, an additional pair of CVLs, and optional conversion of the Kittyhawk Class AKV, Tangier Class AV, and Cimarron Class AOs into CVEs. The added warships reflect a ‘stopgap’ counter to the increased Japanese strength found at war’s start. In addition to its own special modifications, The Reluctant Admiral 6.0+ has been made fully compatible with DaBabes and thus has more ship classes than stock, and many more of the smaller vessels comprising these classes for both sides: yard oilers, coastal minesweepers, auxiliary subchasers, patrol boats, minefield tenders, and many others designed to give a more robust and realistic feel to the development, population, capabilities, and logistical support of bases and rear and operational areas. The Reluctant Admiral 6.0 also incorporates several database modifications that are designed to give a more robust and realistic feel to several combat modes. Database elements have been modified to provide more realistic results for AAA (flak) combat, ASW combat, and certain minor, but nevertheless fun, aspects of naval combat, like land bombardment and coastal defense fire and new modifications to ATA combat. The modifications include lining-up and unifying data elements within certain fields, so that things interface more smoothly, as well as substantial changes to the data elements themselves. Garrison requirements have been raised in China as well as India to, hopefully, better reflect the political environment of the regions. If using the special road movement pwhexe.dat file this serves to slow movement in the CBI Theatre. --6.5 The Jack Fighter has now been eliminated as an option for Japan. --6.6 The French Fleet and Merchant Marine get a major redeployment from earlier versions. --6.7 A number of Editor Slots have been cleaned up, Allied FP Groups added to French and British ships, and other minor errors dealt with. --7.1 Deletes BB Washington (Colorado-Class BB) from the OOB and replaces it with the correct, historical BB Washington. Issue was from work on Treaty Mod. --7.7 Fixed CL Jean de Vienne so it does not withdraw. Examined and worked on Essex (names and dates) as well as US CVLs. American industry is further damaged. --7.9 Fixed 9th Aussie ID coming in and needing to be bought out of a restricted HQ. --8.0 Brought RA more into line with BTS/BTSL with ship names and additions, added CL Java upgrade line, major changes to garrison requirements in India/China lowering them for the most part, and tweaked E16A1 to be more in line with DBB. JWE's DBB Air Combat Model is now used within RA. Production is 'on' for this scenario. Installing this scenario takes time is an easy process; simply download and unzip the contents into the game's SCEN folder. RA will appear as Scen 050 on the Scenario load screen. 1) RA 7.0 scenario is set up for use with an Extended Map that has several enhancements/changes, to both the Map Art and the Map Data, over the stock map that comes with the game. So you MUST download and install the Extended_Map_Data_and_Art.zip file set in order that these scenarios function properly. They WILL NOT work correctly with the stock map art or the stock map data files (pwhexe.dat, pwzone.dat, pwzlink.dat). There is an Installation ReadMeFirst.doc file in the Extended_Map_Data_and_Art.zip and we strongly suggest you open and read it after you download but BEFORE you install the files..
2) If you wish to slow movement down in the CBI Theatre please use the Extended Map for Roads with Stacking Limits. 3) The Reluctant Admiral scenario has many modifications to Ship-Art, Plane-Art, and various Load Screens. The modified Ship and Plane Art files are necessary for the scenario, and the modified Load Screens add some real spice to the presentation. All of the Art is contained in a series of Art Files that are found on the next page. Installation takes a bit of time but is straight forward. 4) The Reluctant Admiral scenario can be played using Babes-Standard individual hex Stacking Limits. If you wish to do so, just download the AE Extended Map Data with Stacking Limits.zip file from the Babes site on the Map Art and Data/AE Stack Limits page. 5.) A detailed and up-to-date Change Log file has been added for download as of RA 7.0. 6.) This Mod is getting to be more and more difficult for the AI to handle. Is best with head-to-head PBEM. Scenario Designers: Stanislav Bartoshevitch (FatR), Michael Benoit (NY59Giants), John R. Cochran, III (John 3rd), Juan Gomez (JuanG), Ben Kloosterman (BK), John (JWE), EJ (SuluSea) and John Young (Red Lancer). RA 7.0+ is now listed as Scenario 50.